What if Dean Martin starred in The Hangover? Or Jean-Luc Godard directed Trainspotting? 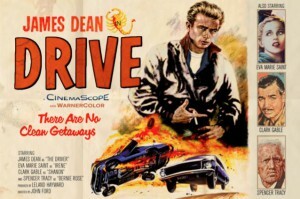 How about James Dean in the Ryan Gosling role in Drive? You could spend hours thinking about how these films would have been different had they been made in a bygone era. You could even get creative and rewrite the scripts. What, you don’t have a spare 4,000 hours to do that? Fine, just enjoy these reimagined movie posters by Peter Stults instead.